Holocaust survivor and Nobel Peace Prize winner Elie Wiesel once said, "For the survivor who chooses to testify, it is clear: his duty is to bear witness for the dead and for the living. He has no right to deprive future generations of a past that belongs to our collective memory. To forget would be not only dangerous but offensive; to forget the dead would be akin to killing them a second time." 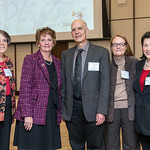 For those of us who had the privilege to attend the Eighth Annual Dr. Marcia Robbins Wilf Lecture on Sunday, November 4, 2018 at Seton Hall University, the answer is truly evident: the stories of our Holocaust survivors must continue to be carried forward for this young generation and those to come. Yet, how can we do this when our survivors are aging and no longer able to share their stories? 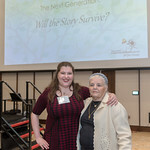 During this lecture, sponsored by the Sister Rose Thering Fund for Education in Jewish-Christian Studies, this question was examined and eloquently answered by the grandchildren of Holocaust survivors in the discussion, "The Next Generation: Will The Story Survive? A Panel of Third Generation Voices Responds." 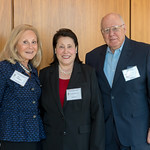 In her opening remarks, Dr. Marcia Robbins Wilf explained that she first planted the seed about the need for addressing this topic with Dr. Paul Winkler, former Executive Director of the New Jersey Commission for Holocaust Education who passed away in 2016. For Dr. Robbins Wilf, bringing the idea to fruition represented a pivotal step toward ensuring that the story will live on. Mr. Michael Rubell, son of a Holocaust survivor and Director of the Morris Rubell Holocaust Remembrance Journeys, moderated the panel discussion and offered many thought-provoking questions for the five grandchildren of survivors to answer. These panelists came from different walks of life and yet were tied together through the bond of being third generation voices. 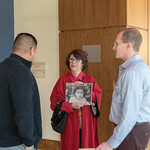 Lisa Margolis, whose grandfather was a Holocaust survivor, told of the memories of the impact the Holocaust has had on her family, and the mission she has to share those stories with others. As a Speech Pathologist, she knows the importance of having a voice and takes this responsibility very seriously. 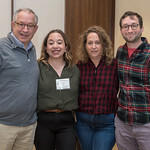 Manya Gaver, whose grandmother is Luna Kaufman, a camp survivor who has published memoirs about her experiences, shared the lessons of perseverance and open-mindedness that have deeply influenced her as a result of Luna’s mission of social justice. 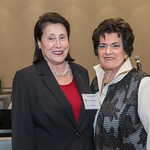 Ms. Kaufman is also a founding trustee of the Sister Rose Thering Fund and a Chairman emerita of the Board of Trustees. Jonathan Hanlon, whose grandfather served in the 11th Armored Division for the United States during World War II and was instrumental in liberating Mauthausen Concentration Camp, spoke of his belief in being an upstander, and in carrying forward the stories he has heard from family members about the role his grandfather played in rescuing camp prisoners from the torture, dehumanization, and horror of a concentration camp. 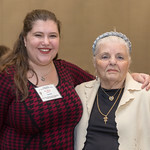 Alexa Joachim shared how her life has been shaped by the experiences of her paternal grandfather, an Auschwitz survivor, and her maternal grandmother, who survived the Holocaust in Nazi-occupied France. 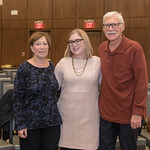 Another panelist, Amanda Lanceter, spoke of the impact that her grandmother, Gina Lanceter, a Holocaust survivor, has had on her life. 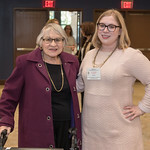 Ms. Lanceter shared how the experiences of her grandmother led her to pursue a career in Holocaust education, and considers it her mission to teach others about the lessons of what we can learn from the past. 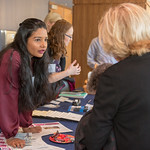 She is currently the Director of Curriculum and Instruction at the Museum of Jewish Heritage - A Living Memorial to the Holocaust in Battery Park City, New York, and devotes her life to teaching the younger generation about the Holocaust in order to prevent the past from repeating itself in the future. After an engaging question and answer session with the audience, the program continued with a beautiful Passing of the Torch Ceremony, in which the Holocaust survivors symbolically passed a burning candle, with their stories and their hope, to the second generation, and then on to the third generation members. Then, all program participants were invited to join the survivor families in carrying the torch to keep the story alive until every ember of prejudice and bigotry is extinguished forever. Lastly, Michael Rubell gathered all of us together to sing an inspiring and moving song, "Be The Change," challenging all to "remember" and "zachor," the Hebrew word for "never forget. 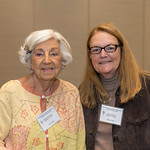 "A reception, graciously sponsored by the Dr. Marcia Robbins Wilf Endowment Fund, followed the program, where all participants were able to gather, socialize, enjoy refreshments, and share stories. By the conclusion of this amazing event, it was extraordinarily clear that the answer to the question "Will The Story Survive?" is a resounding yes. 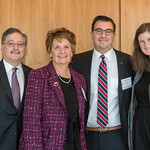 These five third generation voices proved that the messages and the lessons of the Holocaust survivors will continue to teach, inspire, and influence the future.